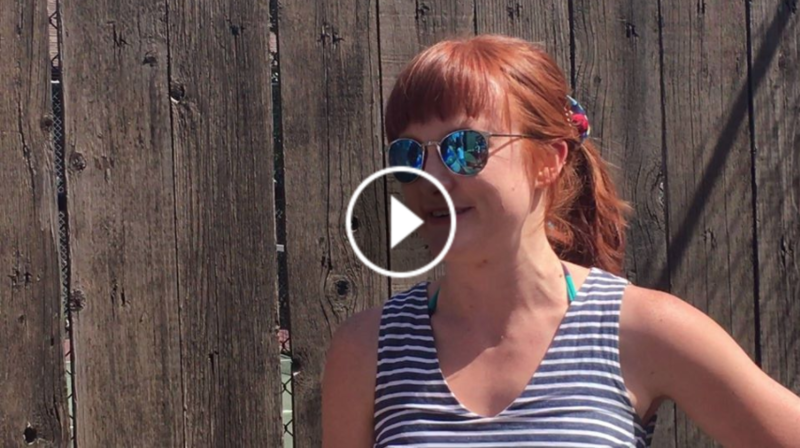 Fundraiser for Jodi Rempel by Zoey Duncan : Send Calgary All Stars to Sweden! Send Calgary All Stars to Sweden! We'll create video of each benchmark ASAP after it is achieved—with the exception of Sweden-specific benchmarks like penalty burpess and eating that famously stanky herring. Videos will be posted here (under UPDATES) and on our Facebook (Calgary Roller Derby - All Stars) and Instagram (@CRDAAllStars). Friends, family, fans, supporters—YOU did this for us! We are so grateful to you for your generosity! You raised $5,000 for us in three days. You did it. You have ensured we can tackle our jet lag with a good night’s rest during D1 Playoffs in Malmo, Sweden. Our hotel rooms are COVERED. We have a lot further to go to ensure that as many teammates as possible can travel to Malmo. We’re going to raise the bar. We’re aiming to raise $25,000. We have dreamed big before. Hotel (quad occupancy x 6 nights; updated figure—original estimate was $1,500 under actual due to some incomplete information): $305 COVERED BY GOFUNDME DONORS! *these costs don't include child care, actual lost wages, physiotherapy for any injuries sustained while playing, etc. Also does not include the costs of running our related fundraisers, which are minimal, but would include things like poster supplies to advertise our garage sale, gas for our trainers to go to bootcamp locations, some online advertising to promote fundraising events, postcards and postage. We intend to reward our supporters with fun updates in the lead-up to and at the tournament as well as a variety of digital downloads. We’re still developing everything, so stay tuned. Super fun: We'll announce some incentives for us reaching certain benchmarks along the way to our ultimate goal. Importantly, everyone who has already donated will have access to the perks as we finalize them. 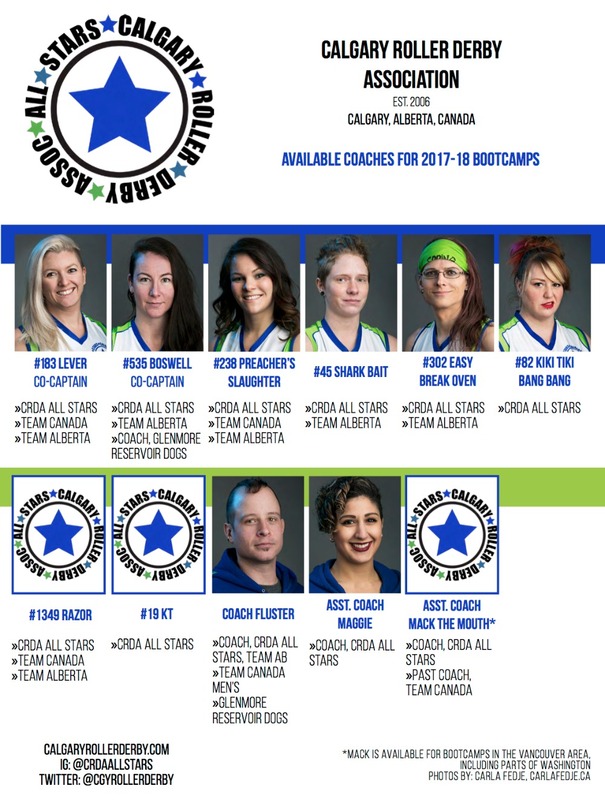 One of our major GoFundMe incentives, we’ll have new bootcamp offerings coming later this week—if you’re a roller derby league within driving distance of Calgary, you can book us to bring proven, experienced D1 WFTDA coaches and/or D1 skater-coaches, including Calgary All Stars who are members of Team Canada and Team Canada Men’s roller derby. 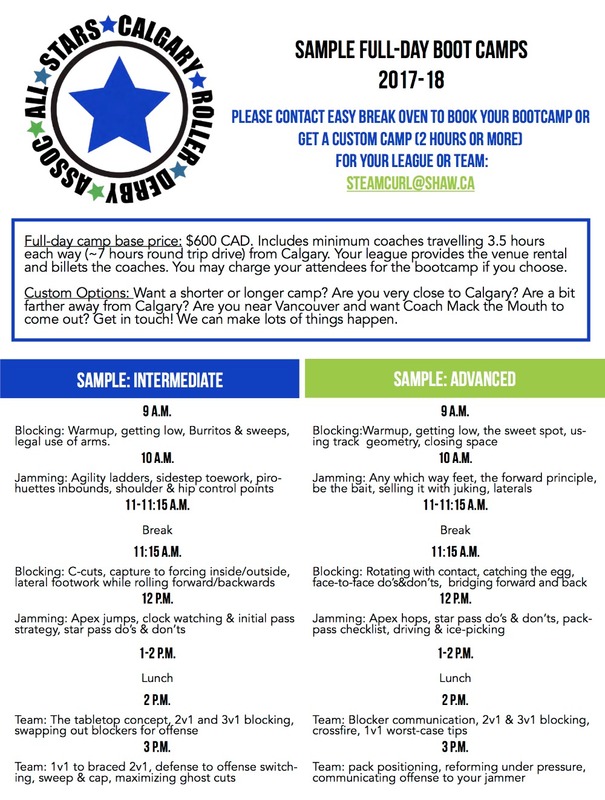 Email Easy Break Oven steamcurl@shaw.ca to inquire about a bootcamp for your league. Outside of GoFundMe, we’re planning a wide variety of fundraising activities, including all the classics, like garage sales, lemonade sales, silent auctions, roller derby watch parties and more. Important Note: If you would like to contribute offline, you may provide cash or cheque to a member of the All Stars. We’ll still count it towards our goal, but we won’t need to pay the 7.9% processing fees (combined fee for PayPal and GoFundMe) on your donation. Again, we can’t say thank you enthusiastically enough for everyone who has already supported us! Hi. 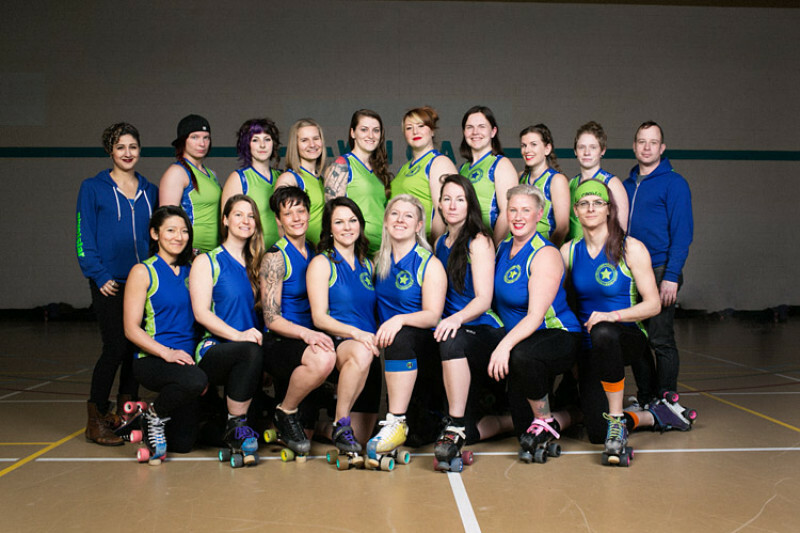 We’re the Calgary Roller Derby All Stars and we’re going to the WFTDA Division 1 Playoffs for the first time! 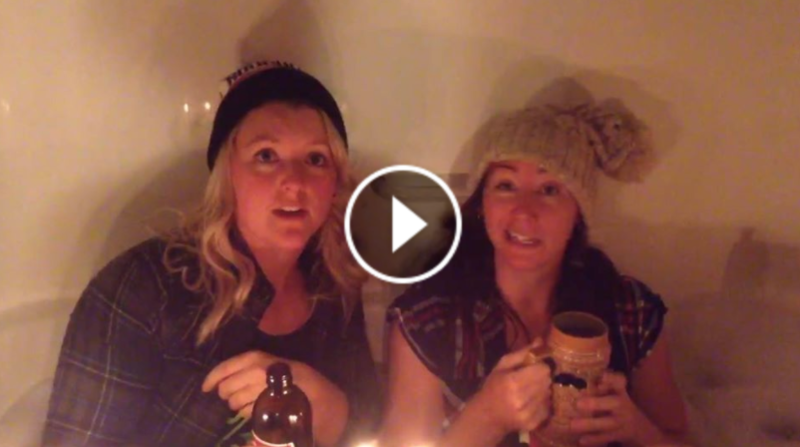 The Short Version: To make this epic journey, we’re amping up our fundraising. 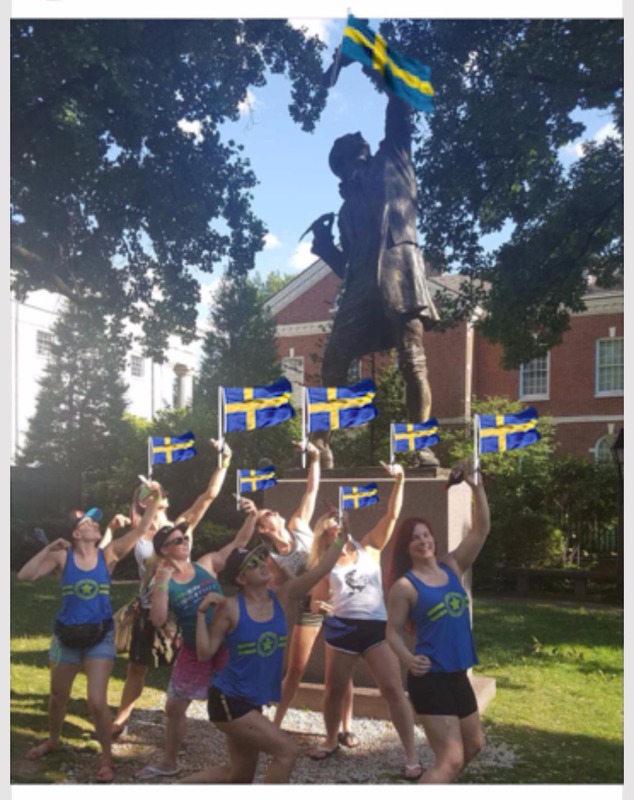 Our fundraising goal is to cover 100% of the hotel/accommodations for our roster and support staff in Malmo and to defray the significant flight costs as much as possible. This $5,000 goal is our starting point, though we'd LOVE to annihilate it and aim even higher. Why should you help us out? You have, of course, come here because there’s something about us you like. We like you too! Your donation not only supports this team you love, but also gets you some cool swag, digital or otherwise. The Longer Version: We had an amazing 2016 season. We planned on three tournaments and got ourselves into Division 2 playoffs for the first time in our history! At D2 Playoffs in Lansing, we won Gold and secured an invite to D2 Champs in Portland! In Portland, we earned Bronze AND got to watch our heroes play. We couldn’t have gotten there—four international tournaments and one on the other side of the country—without our generous donors last year and our leaguemates, sponsors, officials and volunteers who make derby possible. Now, in 2017 the skaters and support staff on this team have paid mostly out of pocket for international travel twice this year. 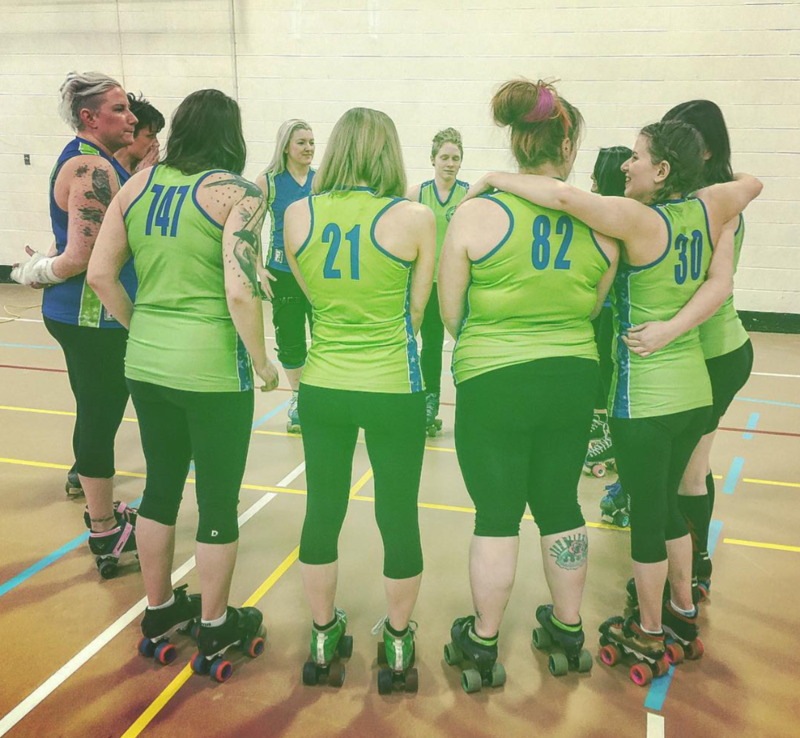 First, in April we went to Tucson, Arizona, for the Dust Devil tournament where we started our season with a bang, including victories over Sacred City and Wasatch roller derby. Our victories were sweet and the post-game tacos were unforgettable. With a huge win over Brandywine, we pushed our ranking to #35 in the world—up 12 spots from a year earlier. So much for 2017 being a rebuilding year. 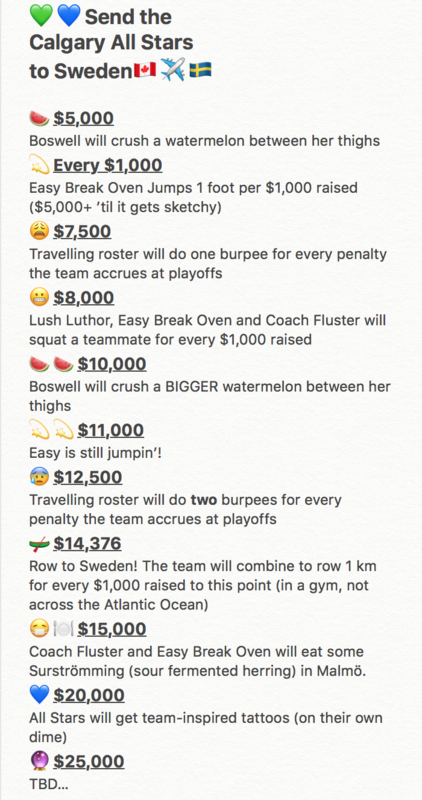 In addition to the donation options here on GoFundMe, we’ll be doing everything we can to help defray the very real costs of flying across an ocean to play the sport we love and represent our country and city abroad. 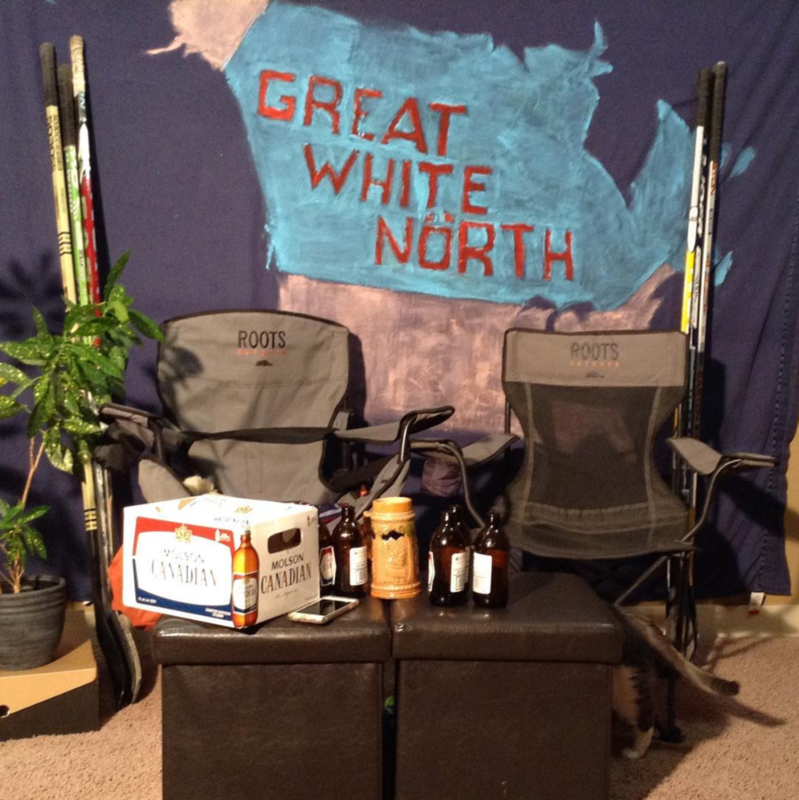 Stay tuned for updates on those fundraising events, especially if you’re in the Calgary area! We’re still awaiting hotel information, but our early research shows roundtrip flights range from about $850 to $1,300 CAD on the low end, which includes about 20 hours of travel each way. We expect to work with a travel agent to secure the best possible deals for our skaters and support staff. Every single donation makes a difference. Thank you for any help you can give! THANK YOU for everything you have done to support us to this point. We know that for many of our generous donors, it's not just dollars you've contributed, but also your time, your cheering lungs and your day-to-day tolerance of (and enthusiasm for!) our obsession with this sport. And it means the WORLD to us. Want to watch us play at playoffs? YES, we'd want to watch us too! 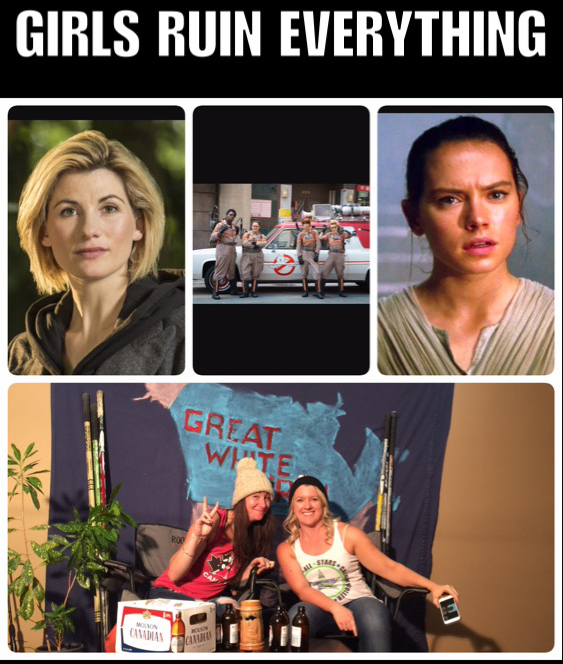 To watch, you'll need to get a WFTDA.tv watchpass. It's about $20 CAD. Go to this page ( https://wftda.tv/watch-pass/) and find the "D1 Playoffs in Malmo Watch Pass" button. IN THE MEANTIME—we're headed to Europe! We'll be in touch! We love you! We REALLY know how to put the fun in fundraising. If you're not tuned into our Facebook page, you may have missed DARE DATE WITH N-GAUGE! Can you believe it's only Tuesday? We have so much for you! NEW! You'll get the brand new All Stars digital cookbook so you can eat like an All Star. In the works now! Est. digital delivery Sept. 1, 2017. Buy the team a round of aquavit! Because when we travel halfway around the world, we need to experience the local culture. +you get a postcard!